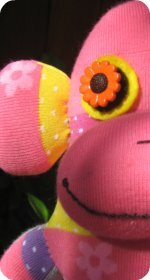 Sock monkeys vary in size depending on the size socks that you use. 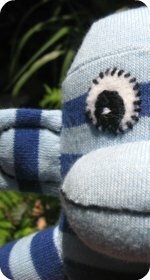 This stuffed toy monkey was made with small sized socks, so it is great for little hands to grab hold of. Step one: You will need plain socks. 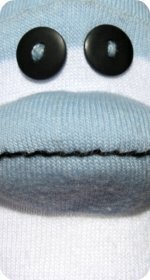 Build the monkeys body, arms, legs and mouth by following the monkey pattern and directions. 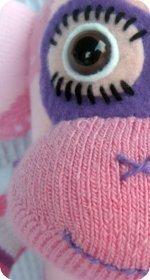 Eyes: Black buttons were stitched on with pale blue thread to match the heel and toes of the socks. His little glasses really suit him and they add a little more interest, as he looked rather plain without them. 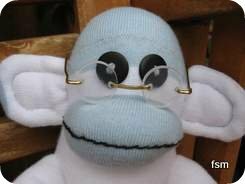 The mini glasses are available from craft stores. 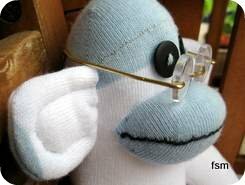 Ears: One of the ear pieces was cut purposely to include some blue from the tip of the sock. 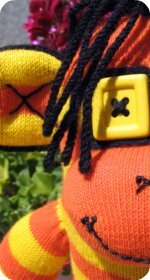 It's a very minor detail but it just adds a very small personal touch to a rather bland looking sock toy. His ears are rather large for his little head and they were cut and sewn in a square shape. Embroidery the blue thread around the inside of his ear. I have actually made some ear patterns out of plain paper that I pin to my socks and sew around when I want nice round looking ears. I just grabbed some paper and traced around some small round objects (or you can draw them freehand if you have a steady hand). Cut them out and you're ready to go. I have 4 different size patterns in my craft box and depending on how much room I have on my sock I just pin on the appropriate size and off I go. 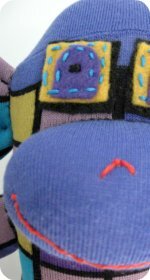 Mouth: Embroider with black thread. 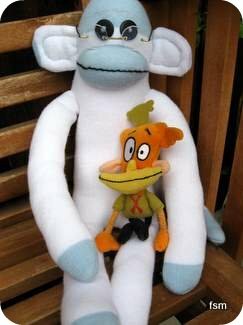 TIP: Adding accessories to a plain looking monkey and other stuffed toy animals can really makes a difference to their appearance. Things like glasses, clothing, hats and whatever else you can think of.